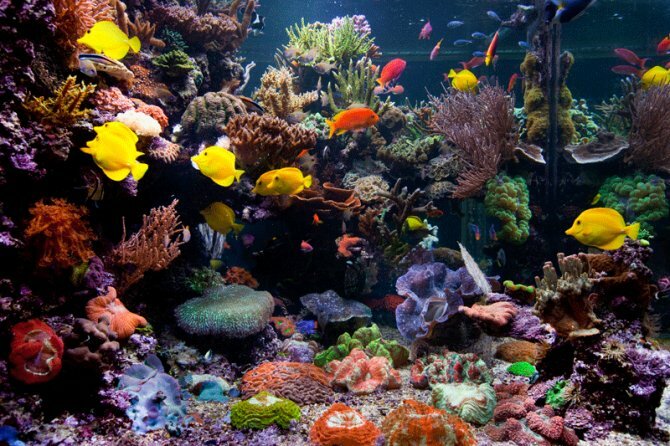 There are many differences between tropical and marine aquariums. Generally speaking, a tank is a tank so the actual physical tanks are the same – in this case though, marine tanks are salt water aquariums which contain live rock and require lots of water movement. Marine aquariums are also heated environments and careful attention needs to be paid to water temperature. Compared to a tropical setup, a marine aquarium is a lot more expensive to maintain and also requires a broader technical understanding of how to make it thrive. Marine fish and live rock tend to be quite sensitive to even the slightest environmental changes and therefore require a lot of TLC.Maintaining the perfect salt level in a marine tank can be challenging. Weekly water tests will give you an indication as to whether or not you are on the right track. Marine aquariums are absolutely breath-taking to look at so don’t be put off by the maintenance and costly setup! We provide exert advise and weekly or monthly maintenance to suit your needs. • Check the fish for signs of stress and disease. • Check to see that the water is not foamy or cloudy. • Check for appropriate water temperature. • Change around 20-30% of the tank water. • Clean the gravel with a filtration device. • Use only top quality salt water to refill the tank. • Perform weekly water tests to ensure correct salt levels are maintained. Starts from R 12’000 per month includes all chemicals and maintenance. Our technicians provide expert advice and are more than happy to come out to your premises to conduct a site survey and assess your aquarium at a time that best suits you! Why wait? Book your site survey today priced at R 1’200 for a callout.